Chatter streams are custom feeds that you create by combining multiple related feeds. Look for streams on your Chatter home page. 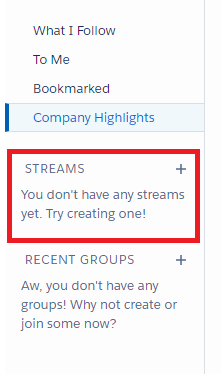 Create up to 100 streams that each combine posts from up to 25 different feeds and feed types. 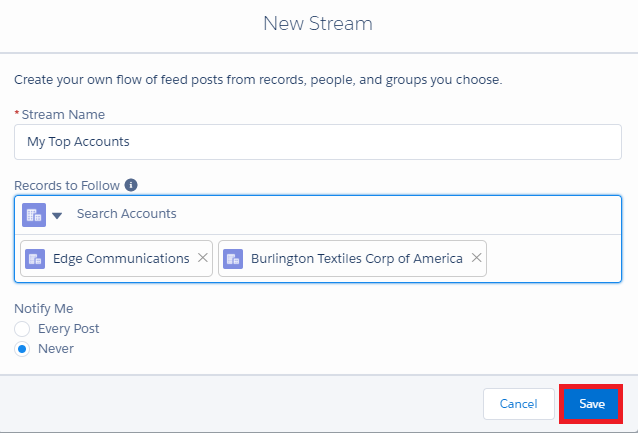 Create streams that combine feeds from people, groups, and records, like accounts, opportunities, cases, and more. 1. Go to chatter tab and get started. Click + to create a chatter stream. 2. Enter details and Save Chatter Streams Salesforce. You will be able to see all the feeds related to the records selected. You can select records across all objects.